The dust has settled on this summer's eco protest at Drax power station in North Yorkshire (see October issue) The "action camp" has moved on, the police have resumed other duties and the media crews are busy elsewhere. But the argument remains; the debate will not go away. At its heart lies the question – does electricity production on such a large scale pose an insurmountable threat to our future? For some it is an article of faith. Renewable energy (wind, wave, solar etc) = good, traditionally generated energy (coal, gas, nuclear) = bad. Environmentalist target: Drax, West Yorkshire. For the self-styled 'eco warriors' there is no debate. Power stations pollute and therefore must be shut down. Transport pollutes and must be stopped. They conjure up a picture of a cosy pre-industrial society of windmills, small-scale craft working, clean rivers and happy agricultural workers swapping produce and making necklaces by firelight. They might relish such a peasant existence, but as a modern nation we have to dismiss the idea. For 500 years we have been moving away from dependence on the elements and human muscle power. We have become sophisticated, and have developed modern industry to meet the needs of a large and active population. We cannot agree to go backwards in terms of development. On the other hand, we cannot close our eyes to the problems posed by power generation, large-scale heavy transport and all the ways we transform nature to make modern life possible. It cannot be denied that pollution is an issue. But the point is, can anything be done about it? Smog was a fact of life in pre-war industrial cities, but clean air legislation, smokeless fuels and improved technology helped charter a way through that particular morass. This is no less true today. The emissions associated with the burning of fossil fuels are harmful. Carbon emissions, particularly in the form of carbon dioxide, are the most prevalent, and represent a significant threat to health. Last year, carbon emissions for the UK totalled 157 million tonnes, a figure that has changed only slightly in the past 15 years. But workers are nothing if not inventive. A closer look at Drax illustrates some of the innovative ways in which carbon and other noxious emissions can be curtailed. In their annual report, Drax identifies four significant carbon abatement technology options to pursue (see Box). A short-term solution is co-firing, where coal is burnt at the power station in a mix with 'biomass' – a range of largely plant-based materials grown specifically for this combustion purpose. Drax has pioneered the use of tall oil, derived from wood pulp. Tall oil is an environmentally friendly substitute for heavy fuel oil, which reduces carbon dioxide emissions at Drax by 300,000 tonnes a year. Further reductions of up to 20 per cent of carbon emissions can be achieved by pre-heating the water fed to the boilers, using either gas or biomass. As in many areas, modern plant designs are cleaner and more energy-efficient than older models. The benefits come from well-designed plant integration, which is an area of strong engineering expertise in Britain. Advanced supercritical boilers use the most up-to-date turbine technology to raise efficiency and at the same time reduce emissions. Carbon capture and storage technology is as yet in its infancy, but offers scope for the future. Essentially, carbon is extracted following combustion, collected and then transported to and injected into depleted oil and gas fields, spent coal seams etc. All of these technology options are cumulative in the impact they have on carbon emissions, which means each investment brings additional savings. The related question of climate change is presently generating more hot air than Drax. It centres on the assumption that global warming is an undeniable fact, that ecological disaster is looming, and that humans with their dirty industry are entirely to blame. What cannot be denied is that we are presently experiencing a phenomenon that could be described as 'global warming' much as earlier periods in our history could be described as 'global cooling'. The history of our climate is the history of climate change. The challenge today is to confirm the extent to which human activity is a contributing factor, and identify the means by which it may need to be modified. This is a scientific question, which demands a dispassionate scientific debate. What we have is not so much an exchange of views as a hysterical screeching from an entrenched position. Battle lines are drawn up within the USA, which regards itself as world leader in thinking on this subject, and everyone else is expected to follow after. Of course the truth is an early casualty. The question too often is not "what are you saying?" but "which side are you on?" And beware pseudo scientific agreements like the Kyoto protocol, which condemns industry but then argues that some of us have already got it, for good or ill, so nobody else should. It's a non-proliferation treaty for industry. The one thing which cannot and should not be accepted is that we are helpless, there is nothing we can do. Human progress can in many ways be described as first identifying a problem and then doing something about it. Wailing, or burying heads in the sand only delays resolution and prolongs misery. To return to Drax with its twelve huge towers and plumes of steam – should we see it as a beacon of progress or monument to folly? Perhaps somewhere between the two, representing a stage in our development. We need to control power generation with due regard for the future. 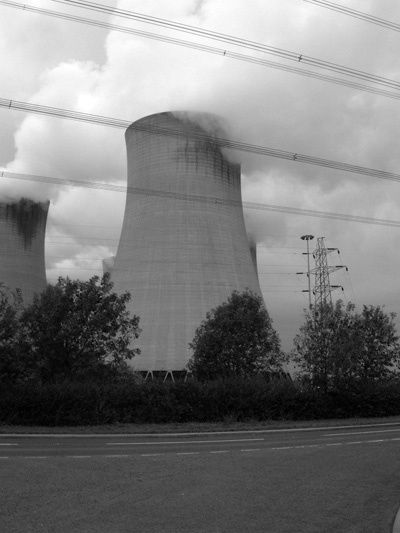 To its credit, Drax has consistently identified problems and worked systematically to find a way towards a solution. In the process it has given a new lease of life to the coal industry as a viable component of the fuel mix. In the medium term, coal is abundant worldwide, and new extraction technology suggests that seams in Britain previously thought unworkable can be recovered, and new deposits extracted. Drax is the 'cleanest', most energy-efficient coal fired station we have, provides on its own 7 per cent of the nation's electricity, and confirms that modern industry can be a pointer to the future rather than a relic of the past.